Relationships are at the heart of the twinning program between schools in the Lasallian Region of North America and the Lwanga District of Africa. Those relationships received a boost with the visit of Brother Ghebreyesus Habte, FSC. Brother Ghebres began his October 20-31 visit at the Christian Brothers Conference office in Washington, D.C., followed by the Regional Conference of Christian Brothers meeting in Minneapolis, Minnesota. From there, he visited a number of schools in the three U.S. Districts with the hopes of strengthening relationships by making a personal connection, learning more about U.S. schools, and sharing details about his ministries. His school visits began in Minnesota at Holy Family High School in Victoria and Totino-Grace High School in Fridley. At each school, he described donations American students make to their twinned schools as acts of salvation. At almost every stop, he asked students and faculty to stand up, hold hands, and walk in place to signify walking together with young people in Africa. 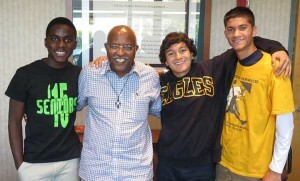 Brother Ghebres, who became Visitor of the Lwanga District July 1, 2014, brought that message with him as he traveled to Louisiana where Archbishop Rummel High School in Metairie hosted a meeting with students from the other three area schools: De La Salle High School and Christian Brothers School, both in New Orleans, and Saint Paul’s School in Covington. After that meeting, he visited each of these schools. Brother Ghebres’ visit then took him back to the East Coast, starting in Washington, D.C., where he visited Saint John’s College High School and spent time bonding with students by playing basketball and talking with student leaders. Next, he was on to Calvert Hall College High School in Baltimore, Maryland, where students led him on a tour, even stopping to try out a few dance moves on stage. 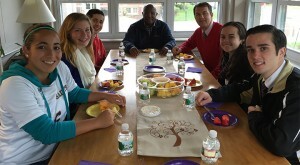 The friendly interactions and Q&A about his District left a strong impression on students. After the visit, senior Chris Swartz wrote this college essay on the impact of meeting Brother Ghebres. From there, Brother Ghebres went to Philadelphia, where he spent time at Jeremy House and was surprised by a reunion with Brothers whom he had served alongside in Africa. He had dinner with postulants before visiting La Salle University the next day. At La Salle, he toured campus and met with students from the university and La Salle College High School in Wyndmoor, Pennsylvania. Then he was off to Rhode Island, where he visited The San Miguel School of Providence, Saint Raphael Academy in Pawtucket, and La Salle Academy in Providence. 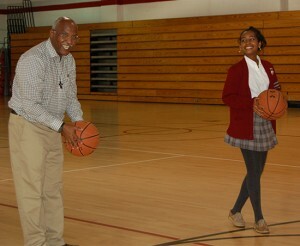 The visits included tours, talks with students, and more basketball – a favorite of Brother Ghebres. The students weren’t the only ones inspired. 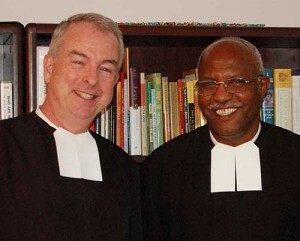 Brother Ghebres left the Region sad and joyful – sad because the visit was finished, but joyful because of the connections he made and what he learned.